There is something about “a man in uniform” that turns most women’s heads. Police officers, soldiers, sailors – we find them virile and appealing, at least that’s been my impression from a rather unscientific survey of female friends and relatives. As romance writers, we want our hero to be as attractive as possible, and we often costume him in a military uniform, the archetypal “Knight in Shining Armor.” I believe this is especially true in historical romance, since contemporary fiction is much more likely to reflect the mixed-gender armed forces and police units that exist in present day society. Men and women who served in World War II have been referred to as members of “The Greatest Generation” and we rightly honor those who served their country and fought against tyranny. My own father, for the most part a peaceful man, was proud of his service in World War II as part of the American Army’s presence in Asia. We continue to honor, even glorify, men and women in uniform as defenders of our freedom. My World War II novel takes place in Europe, and the characters are almost exclusively Italians and Germans. The book opens in 1943 Italy, after Mussolini has been deposed, imprisoned and then rescued by German commandos. At that point, Hitler had Il Duce brought to Germany, and Mussolini agreed to set up a puppet Fascist state in northern Italy under German control. The Italian Resistance, originally composed of independent troops and eventually banded into larger brigades, fought against the Germans and their Fascist allies. As partisans or “irregular forces” (francs-tireurs) they were not protected by the rules of war in effect at that time, and were subject to immediate execution if captured. Both potential heroes in my novel, the Italian partisan and the German officer, could be categorized as soldiers, though only one wears a uniform recognized under international treaties. Isabella Ricci, the heroine, can be viewed as a soldier, too. In fact, her commander refers to her as his “brave little warrior.” She is committed to the Resistance, but unlike other female partisans who took up arms against the enemy, some even commanding brigades, she uses her wiles to elicit military information from the Germans. The only uniform she wears is that of a domestic servant at German headquarters, where she secretly uncovers intelligence to use against the enemy. Throughout history, woman have worn uniforms and taken up arms in defense of their countries; it is not purely a modern phenomenon. Joan of Arc immediately comes to mind. But I have found in historical romance, it is most often the hero who wears the Shining Armor, as least figuratively. BIO: An English major in college, Lisbeth Eng has also studied Italian, German and French. Lisbeth is a native New Yorker and has worked as a registered representative in the finance industry for the past 25 years. 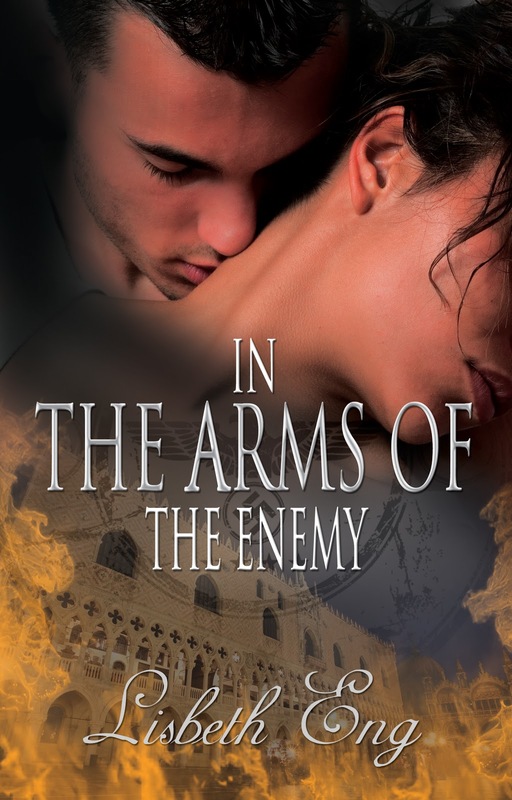 Her first novel, In the Arms of the Enemy, is available in e-book and paperback at The Wild Rose Press. Lisbeth invites you to visit her at www.lisbetheng.com. Although the heroine of my novel, The Bricklayer’s Helper, doesn’t get much of an opportunity for a real, sit-down supper, I thought it might be fun to take a look at what Sarah might eat when her adventures are over and she gets to have an evening meal. One of the odd things I noted when I was researching the Regency period (first dozen years or so of the 19th Century) was the idea—often touted by physicians—that vegetables were difficult to digest. They frequently recommended against allowing folks to eat vegetables if they were ill or in demanding situations, such as soldiers. Really, meat and potatoes (or bread) were considered to be the best things for everyone, although it’s clear that the poor could not afford the amount of meat described in most middle and upper class menus from the period. No wonder poaching was so popular! But there was also a great deal of fish, poultry and other game, which was a good thing or everyone would have had gout like King Henry VIII. So let’s go through a supper designed for a cold evening in February. You’ll note the often odd spelling—I wanted to give an authentic feel to the menu, so I left the spelling and terms “as is” from an 1810 cookbook. Despite that, I hope these give you a feel for cooking during the Regency period. Some of these recipes sound absolutely delicious despite the fact that I would probably have to double my cholesterol medicine if I ate like this. But we tend to forget that everyone walked—a lot—and the average man working aboard a ship or in the fields needed a caloric intake of about 4,000 calories a day. Life was much more strenuous and folks didn’t eat three huge meals. In fact, if you were fortunate enough to partake of a supper like the one listed here, you generally ate only lightly during the day. So this was your big meal, followed generally by another walk or dancing. There was no such thing as a couch potato in the 19th century! So here are some of the recipes that made up the menu above. Shred turnips, carrots, small green onions, celery, and one Spanish onion when to be had. Cut in two or three cabbage lettuces, pick a handful of chervil, and a pint of asparagus peas. Put all into a soup-pot with half a pint of good stock. Put the soup-pot over the stove to boil slow until the stock is quite reduced. Then fill up the pot with good stock: give it a boil, and put a lump of sugar, and a little salt if wanted. Cut the collops from the fillet of veal, flat them, and put them on a dish. Cut a few slices of fat bacon and put them into the frying pan to draw the fat from them, then pour the fat and bacon into a basin, put the collops into the pan and then on a quick stove. Fry them of a light brown; when brown on both sides, put them into a stew-pan that has sufficient quantity of coulis in it, make a few force meat balls and fry them in the fat that came from the bacon. When done, put them on the back of a sieve to drain the fat from them, then put them to the collops, put a glass of sherry wine to them, and a little cayenne pepper. Cut a large fowl into quarters, take out the leg bones, and tie it to a roasting spit. Baste well with butter and when half done, remove and finish it on the gridiron. Season with white pepper and salt. Put the mushrooms in a stew pan with a slice of ham, an ounce of butter, and salt & pepper. Simmer for ¼ of an hour, then put in a little flour, stir with a wooden spoon and put in a little stock and coulis. Put it on to boil for a few minutes, then squeeze half a lemon & add a little dust of sugar. Put the sauce on the dish and top with the fowl. Scald parsley, squeeze, and chop fine. Mix with 2 ounces of butter, and a little salt & pepper. When mixed, put some in each pigeon, skewer them and tie onto a roasting spit. Baste with butter, flower and salt just before they are removed from the fire. Put parsley and butter on the dish and the pigeons afterwards. Boil a dozen eggs hard, and put them in cold water, peel them and take the yolks out quite whole. Shred the whites, put a little chopped parsley into some beshemell: put the whites of the eggs round the dish, and the yolks in the middle, pour the sauce over them, and garnish either with paste or croutons. Croutons are bread cut out with a paste cutter or knife, and fried either in lard or clarified butter. Tie it up in bundles like asparagus, put toast on the dish, and then the sea kail; put a little melted butter over it. Put a few cloves and a little cinnamon into a small stew-pan, put about a gill of water to the spice, and put it on the stove to simmer for a few minutes. Then strain it into a basin and put it to cool. Peel the apples, cut them into quarters, and cut the cores out. Place them in the dish, grate a lemon and put it with the apples, put sugar on them and put the water the spice was boiled in, put paste round the rim of the disk, cover it over, bake it, and put it to cool. When cold, take the top off and put in the custard on the apples; but the top crust into neat pieces and put it round the apples. Lay the bottom of a trifle dish either with sponge biscuit or slices of savoy cake, lay a layer of macaroons and ratafias on the cake, pour a pint of Lisbon wine over the cakes, put on the early part of the day, so as it may have time to soak into the cakes. When the wine is all soaked up put a thin layer of raspberry jam, and on that put a thick custard. Put a pint of milk and half a pint of cream in a stew-pan, a few bits of cinnamon, the peel of a lemon, and sugar enough to make it sweet. Put on to boil, let boil a few minutes, take it off and put it to cool. Put the yolks of six eggs in a basin, half a spoonful of flour and beat them well up, and put the milk boiled for the purpose to them, a little at a time. Strain it through a hair sieve into a clean stew-pan, put on the fire and keep stirring until it comes to a boil. Then take it off and put it to cool. When half cold, put a glass of brandy, with a few spoonful’s of ratafia, then cover the cakes with it, and upon the custard lay apricot jam; then put a pint of good cream into a basin, the white of one egg, about two ounces of sugar, first rubbed to a lemon, about two glasses of white wine, beat it up with a whisk and skim the froth off with a spoon that has holes in it. Lay the froth on the back of a sieve, which should be laid on a dish to save the drainings to return to the pan again for whipping. Lay the whipped cream on over the trifle, put a few harlequin seeds over it: garnish with preserved orange or lemon peel. Blanch one pound of Jordan almonds, and pound them quite fine: instead of water to moisten while pounding, use the white of four eggs beat up, and put half a pound of sifted sugar to them. When done, take it out of the mortar and put them on a plate; spread a baking sheet with wafer-paper, and put about a teaspoonful in each drop; then put them in regular rows, and sift sugar over them before they are put in the oven. They do not require a quick oven. When done, take them out, and let them remain on the sheets until quite cold, then put them either in a covered glass or pan. Make the same in all respects as macaroons, only use bitter almonds instead of sweet, and put the same weight of sugar as of almonds. They should be dropped on wafer-paper; put in two whites of eggs while pounding; put a teaspoonful in each drop; do not sift any sugar over them. That's it! Hope you enjoyed a "taste" of the Regency! Today in the Pacific Northwest is one of those inexplicable days when the weather seems totally out of sync with the rest of the world. After a long, cool and wet "Green Tomato Summer" when the rest of the nation was broiling, today we have brilliant sunshine and bright skies, with an expected temperature of 70 degrees. Indirectly, weather like this always makes me think if an extraordinary man of the 19th Century, a small man of great stature in my mind, J.M.W.Turner. I think of the strange,baffling weather experienced by Northern Europe and North America in the year 1816 which we now know was caused by the giant volcanic eruption of Mt. Tambora in the Indonesian area. Although the average temperature lowered only 3 degrees, this was enough to create massive problems. Crops failed, snow fell in July, and even Niagara Falls froze over. And the skies around the world exhibited glorious sunsets. Nobody knew then what had caused the sudden changes, and they didn't seem to make any connection between the unusual skies and the weather changes. While other people worried about more mundane and immediate problems. one man in particular saw the magnificent glory in the skies and set about to capture it all. 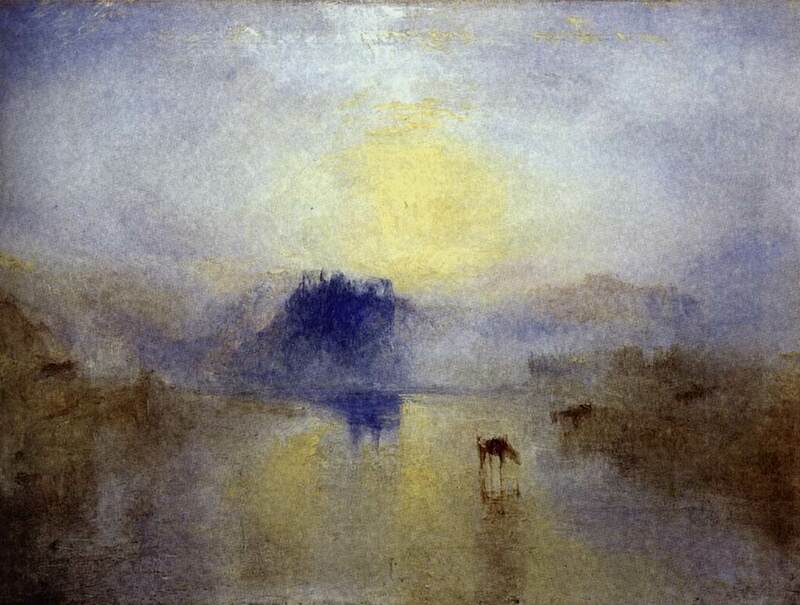 Turner was already a promising artist in 1816, but he had not yet reached the peak of his fame. Like most artists of his day, he was concerned with recording the visual details of life and nature, for there really was no other way to pass them on but through art. And like most painters, he strove for exacting detail. He learned the techniques of the great masters. He hung his paintings in galleries, eagerly hoping for the adoration of the masses. But the sunsets over Europe that year began a change in him that would send his career into new directions. He became enamored with the magnificent colors and patterns in the skies, and perhaps afraid they would not continue forever, he rushed to paint the sunsets all over Europe. He probably had ADHD, for he was an excitable, fast-paced, forever busy man, always sketching when he could not be painting, always wanting to capture everything he saw on canvas. And now he wanted most of all to capture the sunsets. But how do you capture an ever-changing sunset? Clouds shift and colors change from blue to yellow, to gold, orange, red, purple and every shade in between, minute by minute. Even a rapid painter like Turner could not succeed. I think when I look at sunsets how I can simply pull out my point-and-shoot camera and record the memory with a click. No one in his era could do that. But for the next few years, while sunsets remained glorious. Turner streamlined his techniques and caught wonderful skies over castles, over oceans, over mountains and fields. And today we have an impressive array of his wonderful paintings. If you follow the link above, you'll see a gallery of his many paintings on several pages, each one with a link. You might notice, too, that his style changes from the early carefully detailed Classical style, leaning toward the color splashes of the later Impressionists. 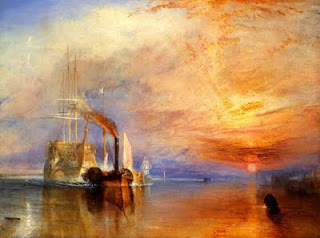 And even though the brilliant sunsets faded., Turner did not forget them. The brilliant splash of light infected him for the rest of his painting life. He became more fascinated by the play of light than the detail of objects. His style became more diffuse, sometimes making the viewer wonder if his sight was fading. It was infectious. Other painters, suffering from the same malady of needing to make a moment in time stand still long enough to capture it on canvas, took up his techniques, painting faster and faster. Impressionism, with its study of light play and form,was being born. And you can see its beginnings in the paintings of Turner's lifetime. Turner was extraordinary in many ways. And I'll tell you someday how he was one of the first to use his own form of mass media to promote his work and sell it when other artists stuck to the old tried and true ways and starved. But most of all when I think of him, I think of the sunsets he saved for us, and how he tried to paint them all. If you’re like most folks, you likely think the Old West stopped at America’s Pacific Coastline. Which it does if you travel three thousand miles farther. Yes indeed, Hawaii has a cowboy history all its own. It even involves vaqueros! Those first cowboys, Mexican vaqueros, taught Texan buckaroos how to lasso, make lariats and herd cattle. But much earlier in the 1800’s, those guys traveled across the Pacific and roped longhorns in Hawaii. Captain George Vancouver brought Hawaii’s first longhorn cattle as a gift to King Kamehameha I in 1793. Vancouver believed he’d delivered a new resource to the islands, but His Majesty imposed a ten-year kapu (restriction), making them a protected species. The animals were allowed to roam wild and breed freely. Consequently, the herds became a nuisance, harming native vegetation and forests. Upon descending the uplands, the cows knocked down fences, trampled village gardens, and destroyed taro fields. So vaqueros from Mexico and Portugal were imported to control the cows and teach native ranchers how to oversee the herds. The islanders called these guys paniolo. 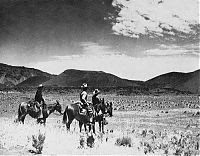 Ranchers constructed stone walls and cactus barriers to stop the foraging beasts. Tourists today sometimes view old rock walls in Hawaii and assume they’re ancient heiau (temples) or home sites. But more often than not, these rock piles are just leftover cattle walls! Like cowboys everywhere, a paniolo relied on his horse to round up the wild pipi (cattle) from the places they shouldn’t be in a particular method called Po'o Waiu, which is now a rodeo event. In 1908, a paniolo and rodeo champ named Ikua Purdy set the rodeo world on fire with his roping and riding skills at the Cheyenne Frontier Days in Wyoming. Not long ago, Purdy was inducted into the Cheyenne Frontier Days Hall of Fame. 2008 was designated The Year of the Hawaiian Cowboy by Hawaii Governor Linda Lingle and Harry Kim, mayor of Hawaii (the Big Island) County. 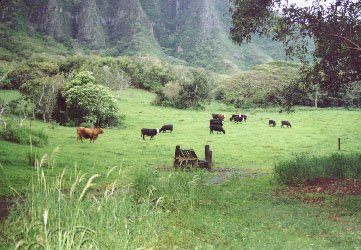 Today about 75 percent of the state’s cattle roam the Big Island of Hawaii. Fifth and sixth generation Hawaiian cowboys continue to raise, herd, brand, and market cattle. 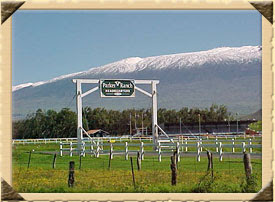 Parker Ranch is among the largest ranches in the United States, spanning some 150,000 acres across the Big Island. Established nearly 160 years ago, it is also one of the country’s oldest ranches. 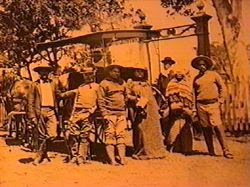 The ranch’s story begins in 1809 when nineteen-year-old John Parker jumped the ship that brought him to Hawaii. He quickly came to the attention of King Kamehameha I for his new, state-of-the-art American musket. The gun got John the “privilege” of being the first man allowed to shoot some of the thousands of maverick cattle wandering the island’s remote plains and valleys. Due mostly to John’s efforts, salted beef replaced sandalwood as the island’s chief export. A recent trip to the Islands took me to Koloatown on the sleepy island of Kauai. Established in 1835, it's often still called Homestead and looks like someplace you'd find in Wyoming, full of charm and history. I hope you enjoyed this little bit of aloha yee-haw! But I hope you'll ride on back to 1880 Nebraska where in my latest, Marrying Mattie, Mattie Carter falls for a handsome horse doctor, Call Hackett, only to have their wedding vows broken up by her evil ex. There was a time when women were little more than chattel. Women couldn't own property, they were not entitled to their own money, had no voice in politics and were not allowed to vote. We've heard of Carrie Nations and other women who led the fight for women's rights. Alice Paul also took up the cause. She and the ladies who followed her suffered, brutally, for the rights women enjoy today. Alice Paul was raised as a Quaker, attended Swarthmore College, and worked at the New York College Settlement while attending the New York School of Social Work. She left for England in 1906 to work in the settlement house movement there for three years. She studied at university in England, and returned to get her Ph.D. from the University of Pennsylvania (1912). Alice Paul led the more radical wing of those who were working for women's suffrage in 1917. She had taken part in more militant suffrage activity in England, including hunger strikes that were met with imprisonment and brutal force-feeding methods. She believed that by bringing such militant tactics to America, the public's sympathy would be turned towards those who protested for woman suffrage, and the vote for women would be won, finally, after seven decades of activism. And so, Alice Paul, Lucy Burns, and others separated in America from the National American Woman Suffrage Association (NAWSA), headed by Carrie Chapman Catt, and formed the Congressional Union for Woman Suffrage (CU) which in 1917 transformed itself into the National Woman's Party (NWP). During WWI, these suffragettes planned and carried out a campaign to picket the White House in Washington, DC. The reaction was, as in Britain, strong and swift: arrest of the picketers and their imprisonment. Some were transferred to an abandoned workhouse located at Occoquan, Virginia. There, the women staged hunger strikes, and, as in Britain, were force-fed brutally and otherwise treated violently. I don't know about you, but I find such brutality, against women, an outrage. Long life the memories of the courageous suffragists who fought for the freedomes women enjoy today. Bannon's Brides now available at The Wild Rose Press and other on-line stores. We romance authors hear it all the time: "Readers want strong alpha heroes! Make your hero braver, stronger, larger than life!" I used to think that the AM only existed in literature until I started researching the early Britons and Vikings and realized that the Alpha is alive and well throughout our past. Some famous Alphas come to mind: Alexander the Great. Attila the Hun. King Arthur (ok, I threw that one in as a nod to hunky Clive Owen's turn in the movie!). Napoleon, and his nemesis, the Duke of Wellington. Edward, the Black Prince and any one of the Knights Templar. Many Alphas rose up during turbulent times to become great leaders or warriors. Some, like William Wallace, fought for freedom. Others, like Eric the Red and his son, Leif Ericsson, discovered continents and established a Norse presence over much of Europe and Russia. Royal Alphas abound. England's Henry V rode into battle with a bare head so his enemies would know who he was. Genghis Khan conquered many lands to unite what is now Mongolia. The Vikings wrote the book on Alpha Male lore. Like many ancient groups, they believed their death was foretold, so it made no difference if one stayed home to watch the farm or decided to go "a-Vikinging." If it was your day to die, it hardly mattered if you were plowing or plundering. That explained their fearsome, ferocious reputation among their enemies. Courage in the face of death was treated as something natural. To fear death was against the norm. Not to be outdone by its Norse neighbors, America has its own share of colorful Alphas. Wyatt Earp and his legendary brothers. Davy Crockett and Colonel Travis of Alamo notoriety. Great presidents, like Andrew Jackson, Thomas Jefferson, and Theodore Roosevelt (who says you have to look like Hugh Jackman to be an Alpha?). Geronimo and Sitting Bull and other Native American leaders made their mark on the American West. Many other men qualify, but these are just a few to set you on your own path of discovery. Sometimes, you don't have to crack open a history book or google a name. We have Alphas in our own lives. My own dh, Walter, epitomizes (to me, at least) a "man's man" - a true Alpha. He left high school in the 70s to enlist with the Marine Corps and went to Vietnam. He has always owned his own business and gets out of bed at 5am, even on weekends. He's often worked more than 70 hrs a week running his own construction business, urging on his younger, healthier employees who are worn out. He is a natural leader, overcoming a troubled childhood and reckless youth to become the man he is today. All of us have a father, husband, brother, uncle, grandpa, etc. who can fit the profile of an Alpha. A hero doesn't have to create an empire of millions or lead soldiers into battle to be an Alpha. When I write my own heroes, I usually imagine certain traits to round out the character so he's not a cookie cutter image of someone else's idea of what a strong hero is. But if we just look at real men in real times, we can put together a profile of what an AM looked like. Strong, whether physically, mentally, or both; independent; braver than most men of his time; a natural leader; often a warrior, whether in the boardroom or battlefield; and just that special something - a touch of power and charisma. Put them all together and you have a hero to be reckoned with. Women living in the west in the 1800’s dressed in the silks, satins, and fashionable dresses just like their sisters in the east for special occasions. However, they also dressed decidedly different when facing the rigors of western living. In the rural areas women’s clothing could be dated to when they first arrived from the east up to ten years earlier. Silk and satin could be scarce in the rural areas. In these instances they would make ball gowns out of gingham and calico adding all the extra flounces, bustles, and trains. Adding handmade lace collars and wool braid around the hems to enhance the garments. They would have one special dress they wore only to dances, church, and socials. They would wear a corset with their finest dresses to special occasions. Common material for women’s clothing was linsey-woolsey, calico, silk, plaid, muslin, printed cotton, wool challis, dimity, and grosgrain-striped silk taffeta. Most garments had a pocket sewn in the right side seam. Generally each dress was the same style, the fabric and decorations made them different. In the early part of the 1800’s most wore one piece dresses. A dress with a full skirt required 10 yards of calico or 14 yards of silk because silk wasn’t as wide on the bolt as calico. From 1850 on women started wearing two-piece outfits(skirt and blouse). It wasn’t until the 1890’s when the “shirtwaist” or blouse became popular. By 1886 the chemise was replaced with the camisole a shorter version of the chemise with square or round neckline, lace and embroidery. In 1882 stores began selling ready-made clothing. Traveling on stage coaches and trains they wore linen dusters to keep the dirt and coal dust off their clothing. Three essentials of any western woman were their apron, bonnet, and shawl. An apron was a full length garment worn while cleaning the house and cooking. It helped to keep their clothing clean, making less laundry. They called any type of hat a bonnet. Most had a sunbonnet with ties under the chin and a wide cloth brim reinforced with cardboard or thin slats of wood to make the brim stiff and keep the sun off their faces. They would also have a winter bonnet or hat. Some would even have a fancy bonnet to wear to weddings, funerals, and socials. The shawl was a quick wrap to throw on to greet company or make a trip to the outhouse. They usually had a special one to wear to social events if their family had the means. Working and dealing with the heat they would shed undergarment layers, specifically petticoats and a corset. Rather than the 5-6 petticoats that was customary they would work in one or two. This also helped on wash day when they only had to laundry a couple petticoats and not half a dozen. To keep their skirts down without all the layers hide their limbs, they would sew metal bars or lead shot in their hems, thwarting any strong winds. They would also wear bloomers under their skirts rather than all the layers of petticoats. In winter they would wear flannel or quilted petticoats. Western women worked by their husband’s sides. To make their chores easier they shortened their skirts, wore split skirts and some even wore men’s clothing. It made walking and riding horses easier. They also were less likely to wear the tight corseted styles. They could do their work easier in loose-fitting garments. This information was found in: The Writer’s Guide to Everyday Life in the Wild West by Candy Moulton. Photos were copied from: http://recollections.biz/Merchant2/merchant.mvc? Since I don't have historical facts to share today, I thought I'd share my mother-in-law's bread and butter pickle recipe. They've been a favorite in our family for the 43 years my husband and I have been married and longer. If you like to can, I hope you'll give this recipe a try. Bring to a boil. Drop in onions, peppers, and drained cucumbers. Heat to scalding hot, but do not boil. Seal in jars. (Cook in enamel ware or stainless steel pot. Do not use aluminum.) 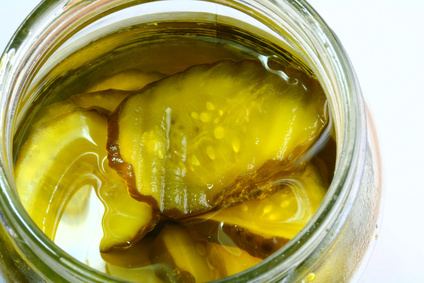 Chill pickles before eating for crispness. Halloween as we know it today was not really a holiday during the Regency. On October 31, the Celts celebrated Samhain, a harvest festival which contained some elements of a festival of the dead. The Christian religion attempted to neutralize the pagan Samhain by combining it with Christian holy days. November 1 was All Saints' Day, or All Hallows Day, so October 31 became All Hallows' Eve. 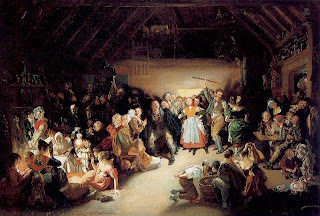 By the Regency, All Hallows' Eve was mainly a rural festival, rarely noticed in the cities. Elements of Samhain remained in the customs of guising, lighting bonfires, and carving jack o' lanterns. On Samhain, the barriers between the real world and the supernatural world thinned, allowing the dead, as well as evil spirits, to walk the earth. People left their doors open to welcome the ghosts of their ancestors inside, while at the same time keeping the evil ones out. An associate custom was guising, in which people dressed as ghouls. By blending in with the demons, they avoided them. Bonfires were also popular on all Hallows' Eve. The fires lit the way to the afterworld of relatives who had died during the past year. They also scared the specters and goblins away. Carving jack o' lanterns was another custom. Believing the "head" of a vegetable its most potent part, the Celts carved vegetables into heads with faces to scare away supernatural beings. By Regency times, these lighted vegetables were called jack o' lanterns from the seventeenth century Irish legend of Shifty, or Stingy, Jack. Shifty Jack, so evil neither Heaven or Hell would take him, was doomed forever to wander the earth while carrying a lantern. 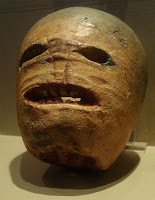 The lantern was usually carved from a turnip or mangelwurzel, as pumpkins were largely unknown in Britain at the time. Since turnips and mangelwurzels are dense, not hollow like pumpkins, carving such a jack o' lantern was a great deal of effort. The beginnings of many of today's Halloween practices existed in the Regency. If you enjoy Regency and Halloween, you might like Pumpkinnapper, my Regency Halloween comedy. Pump kin thieves, a youthful love rekindled, and a jealous goose. Oh my! And I'm running a contest from now through October 20. The prize: a PDF copy of Pumpkinnapper. Leave your name and email in the Guest Book on my website, http://www.lindabanche.com, for a chance to win. P.S. The top picture is Snap-Apple Night, painted by Irish artist Daniel Maclise in 1833, of a Halloween party he attended in Blarney, Ireland. From Wikipedia.